Praised for his “great skill and captivating sound” by Clariperu, American clarinetist Calvin Falwell is quickly becoming a sought after soloist and chamber music collaborator. His performances have garnered praise from critics and audiences around the world. 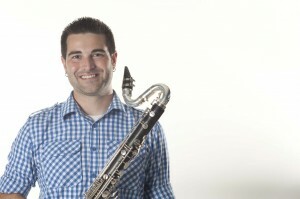 A true champion of new music, Calvin has had the privilege of premiering numerous works for both clarinet and bass clarinet including works by Todd Goodman, David Thomas, Max Lifchitz, Suzanne Polak, Bradford Blackburn, Paul Reller, David Stock and Joseph Hallman.As a soloist he has developed an extensive repertoire for bass clarinet. Solo appearances include concerto performances with the McCormick Percussion Group, West Chester Percussion Ensemble, South Florida Symphony, Beaver Valley Philharmonic and contemporary ensembles in Philadelphia, Pittsburgh and Louisville. Recital tours have taken him to South America, China and Europe. As an orchestral musician Calvin held positions with the Sarasota Opera Orchestra and the Orlando Philharmonic Orchestra. Calvin has also appeared with the Florida Grand Opera, Miami City Ballet, Florida Orchestra, Louisville Orchestra, Lexington Philharmonic, Opera Tampa, Opera Naples, Palm Beach Symphony and Pittsburgh Opera Theater among others. Additionally, Calvin has toured internationally with the Hollywood Concert Orchestra. Former faculty appointments include Holy Family University, Wilmington University, Hartwick College Music Festival, Blue Lake Fine Arts Camp and AMEROPA Chamber Music Festival. Currently, Calvin holds the 3rd/Bass Clarinet chair with the Sarasota Orchestra in Sarasota, FL and is Professor of Clarinet & Bass Clarinet at The College of New Jersey and the University of South Florida where he is also the Artistic Director of the annual South Florida Clarinet Fest. During the summer months can be found performing with the Ash Lawn Opera Festival in Charlottesville, VA and Green Mountain Opera in Barre, VT.
His principal teachers and mentors include Paul Demers (Philadelphia Orchestra), Ron Samuels (Pittsburgh Symphony Orchestra), Tim Zavadil (Minnesota Orchestra), Dallas Tidwell (Louisville Orchestra), Daniel Lochrie (Nashville Symphony) and Scott Locke (Murray State University). Both Calvin’s BM and MM are in Clarinet Performance and are from the University of Louisville and Duquesne University respectively. Calvin is both a Selmer Paris and D’Addario Performing Artist, performing on Selmer Clarinets and D’Addario Reeds exclusively. Calvin lives in Tampa, FL with his wife Kerry Falwell, son Zachary and their two cats Ronald & Callie. Look for Calvin’s recordings The Music of Max Lifchitz with Ars Nostra and his new solo bass clarinet CD Fine Tune. Available onNorth/South Records and Potenza Music. Also available on iTunes, CD Baby and Amazon.